Decocino is the leading baking decorations maker in Austria and the no. 2 in Germany [after Dr. Oetker]. 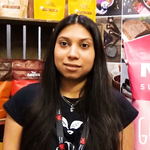 At ISM 2019, the company partnered with renowned online TV vlogger Sally Özcan, who presented bakery concepts using the company’s product solutions. She speaks about the role for social media in food marketing and bakery trends.